That One Pen has been around for a while now. I’ve posted several dozen reviews and have been fortunate enough to accrue something resembling a decent readership. What I have not done is clearly written about what I actually use on a consistent basis. For those of us afflicted with late-stage pen and/or pencil addiction, writing tools constantly fall in and out of favor. However, over time, we find ourselves returning to a short list of favorites. What follows is a somewhat lengthy consideration of my pen and pencil short list. As with any such list, it is idiosyncratic, biased and personal but it is not hastily constructed. Trust me – the overflowing storage boxes and lower-than-otherwise-would-be bank account are evidence that this post is the result of plenty experimentation. Here are the ground rules for this post – no categories and no rankings. I do not want to get caught up in listing my top 5 this and my top 5 that because I do not use pens and pencils based on their relative ranking in a particular category. I use stuff based on some random combination of needs and wants. Also, ignore the order in which these items are listed. If it is in this post then I like it, use it and recommend that you consider it as well. One final point. I only selected writing tools that I use, or at least have handy, multiple times in a typical week. As a result, the list is light of fountain pens. It’s not that I don’t have and use fountains pens with some frequency it’s just that only one or two are consistently inked and handy at most times. We’re focusing on the work horses here. Let’s get started. The gel pen category is huge and seems to grow every month. The range of colors, ink properties and point sizes makes the gel pen options dizzying at best and bankrupting at worst. That said, if you can buy it at Staples or order it from Jet Pens, odds are I’ve tried it. For me, the micro, needle points tend to be too scratchy and inconsistent with respect to ink flow and the broader points tend to be too wet and I need quick drying ink as a lefty. So, medium points usually find the sweet spot between smoothness, feedback and dry times. Enter the Pentel Energel. Like I said – I’ve tried just about everything in this category. Yes, I’ve flirted with other options and even gone steady with more than few, but in the end I always come back to the Energels with the 0.7 mm point. From the Deluxe RTX to the Energel-X to the Alloy to the non-retractable options, these pens come in a variety of body types. Personally, I prefer the Energel-X. The Deluxe is a tad too long. The Alloy is a bit longer still and also less comfortable and the non-retracble versions are less convenient. In a perfect world, one of the established machine pen makers will use the Energel refill as inspiration for a future design. Are you listening Karas Customs, Tactile Turn, Ti2 Design, BigiDesign, etc.?! One quick note – the Energel ink is not water-resistant so do not write your mortgage check with these pens. Actually, don’t write your mortgage check at all – send it electronically. Given that I write 2 checks a year (at most) and have never had issues with water ruining important papers I’ve written, I consider the water thing a total non-factor. Speaking of machined pens…Of all the categories of pens, I find machined pens (especially those offered on Kickstarter) particularly tempting. What late-stage pen addict can resist the idea of a purpose-built pen while also supporting an entrepreneur chasing his or her dream? Heck, as a teacher I’m easily sucked into a story of hope and potential so Kickstarter is basically design to get money from folks like me. All of that said, I have grown weary of quality control in the small to medium batches that these vendors deal with and a bit tired of the utilitarian design favored by this segment as well. I am not saying machines pens are poorly made but I am saying I have sent multiple machined pens back to multiple vendors for minor tweaks here and there. Not a huge issue but it is a thing. Anyway, to me, the best pens are simple, efficient and maybe even a bit classy. I’m not going to get on any particular makers, but I have discovered that pens made from slippery aluminum tubes with screws showing on the clip are not my thing. Now, the Mover and Shaker pens from Tactile Turn give me the chance to support a small business and get an object that looks and feels like a pen. The shorter Shaker takes Parker-style refills. The longer Mover readily accepts G2-type refills. The Mover is a touch too long for my hand, but I do get a fair amount of use from my Mover when its loaded with a 0.5 mm Pilot Juice refill (more on this pen below). I don’t use it frequently, but it has a permanent place in my pen cup so it belongs in this list. Likewise, the Shaker is not my primary Parker-style refill pen (read on to find out which one is) but it’s certainly makes the short list. Honestly, how many cheap mechanical pencils does the world need? If every pencil manufacturer stopped making mechanical pencils tomorrow wouldn’t it be about 20 years before we would notice the beginnings of a shortage? I enjoy mechanical pencils as much as the next guy, but pound for plastic, there may not be another category of writing implements I’ve blown more money on than cheap mechanical pencils. Enough complaining. What less expensive mechanical pencils do I keep coming back to? Staedtler 925 and Uni Kuru Toga. Like all cheaper mechanical pencils, both of these pencils are a tad too light for me but they are also among the most comfortable writing tools, pen or pencil, I own. 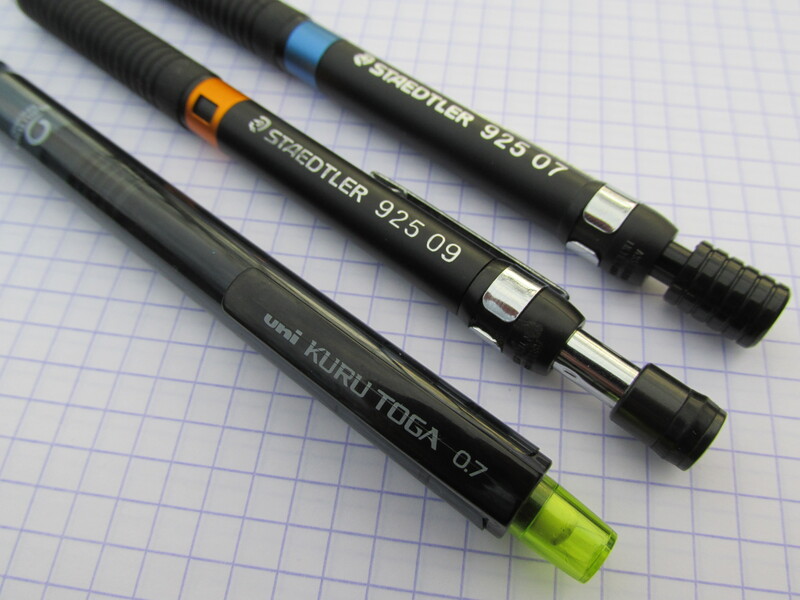 There isn’t any fancy about the Staedtler 925, but the ridged rubber grip is comfortable without being too squishy. As you probably know, the Kuru Toga has a cool clutch mechanism that keeps the graphite line consistent and the subtle contours of the grip area provides plenty of control. There are other mechanical pencils I carry with me and use more frequently (see below) but I have multiple sets of Kuru Toga and Staedtler pencils in multiple locations to make sure a decent mechanical pencil is always handy. To try to talk about all that fountain pens have to offer in the context of this post would be silly. There simply is too much history and too many options to get into it in one post, two posts or twenty posts. I have about 20 fountain pens in my collection but time and time again I come back to my TWSBI Mini. It’s not the best looking fountain pen I own. That honor might go to my Parker Vacumatic. But it is the fountain pen that fits my hand the best and works perfectly each and every time. 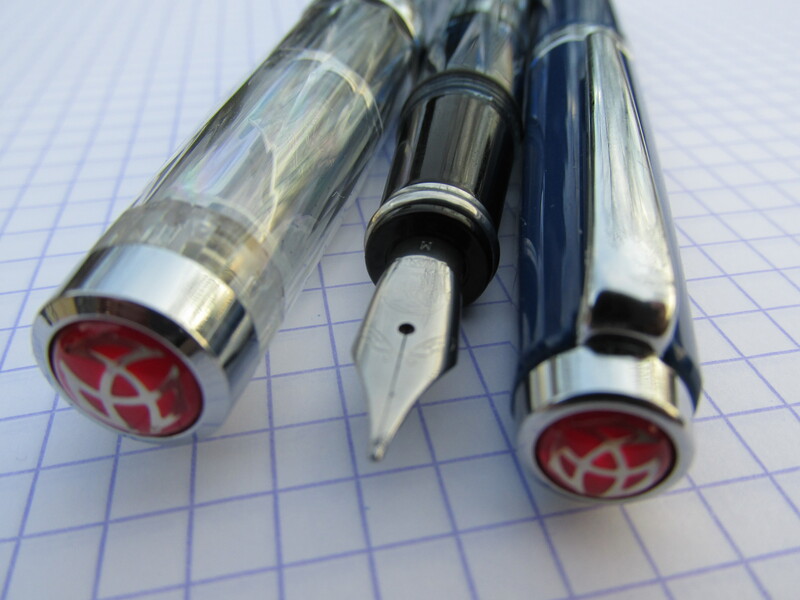 It has to be the nib and feed because the TWSBI Classic, which uses the same hardware, is also rock solid for me. I prefer the slightly wider barrier of the Mini compared to the Classic and if only the darn cap of the Mini would just slide on instead of screwing on the back to post, the Mini would be perfect. While I may not use it as much as other writing tools on this list, I want to give a shout out to the Vac 700. It’s one of the quirkiest pens I own and it’s far too big to carry around but it is the ideal tool for when I want that old-school-sitting-at-my-desk-writing-like-it’s-1925 feeling. Again, there are plenty of other fountain pens in the collection but none, including the vintage pens I own, have earned my trust and loyalty like the TWSBIs. One more comment. My TWSBI Mini did develop a crack in the body. I sent an email to TWSBI USA on a Sunday morning and I got a positive reply within minutes. That, my friends, is how you do customer service. 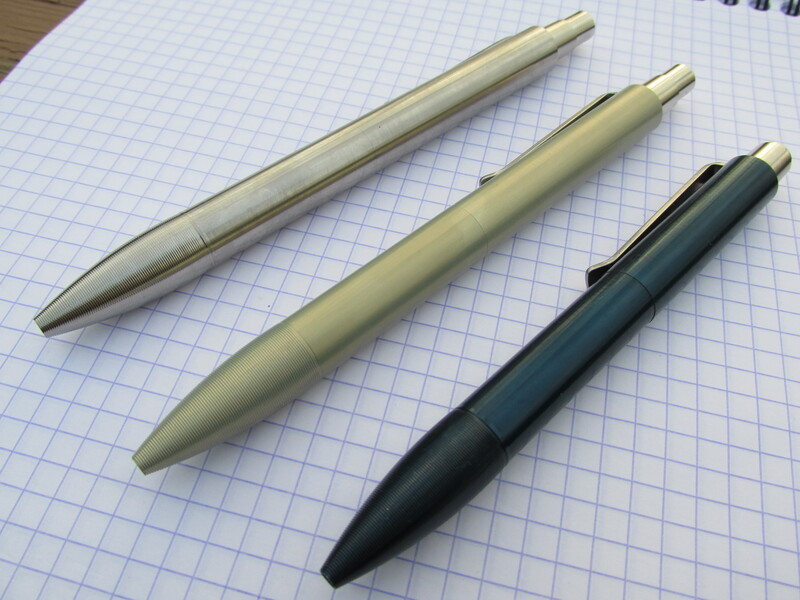 I don’t care what any of you pen snobs think – I love the Parker Jotter. What’s more, I like them best when they are loaded with the basic Parker Quink ballpoint refill. How do you like them apples pen dorks?! Along with spending far too much time trying different cheap mechanical pencils, I spend way too much time (and more than a few bucks) down the Parker-style refill rabbit hole. I bet I could find (conservatively counting) 15 different types of Parker-style refills in my home office in under 20 seconds. While a Fisher Space Pen refill and a 100% fresh Visconti gel refill have their benefits, I continually come back to Parker’s own Quink refill. I’ve been debating between medium and broad point recently, but one way or another it’s typically Parker Quink for me. As for the Jotter itself, its iconic design is the epitome of simplicity, efficiency and class. In truth, the Jotter is probably a few millimeters too thin to be perfectly perfect for me, but that’s just me being perfectly picky. Whether it’s a quick line on a Post-it Note, a to-do list on an index card or problem solving in a student’s five subject notebook, I know I can grab a Jotter and get a solid result each time on any paper and look classy while doing so. Remember, the Jotter has been around since 1954 so you get relatively inexpensive collectability and the benefit of touching history with each pen stroke. Love. It. I don’t always use a wood-cased pencil (because why would I) but when I do, I like to keep it simple and/or yellow and/or smooth and/or slightly hard. Wood-cased pencils are a whole thing unto themselves. I have allowed myself to dip more than a big toe into this pool but, like my 8-year-old self, I refuse to dive in head first. I have learned enough to know that there are bad pencils, decent pencils, good pencils and (supposedly) really good pencils but given that wood-case pencils are not terribly portable and there simply is no way I’m going to use more than 8 wood-cased pencils in my statistical speaking 34 years left on earth, I’m just not going to go there in any significant way. Why do I prefer F grade graphite? I’m left-handed and prefer not to look like I’ve been playing in the dirt after writing. The Dixon is on this list because (a) the F/2.5 grade version is fairly easy to get, (b) I have a thing for iconic design and (c) it has an eraser. The Tombo Mono is on the list because it’s the best writing wood-cased pencil that doesn’t smudge that I’ve tried to this point in my life. So why not just go with the Mono alone? See items (a), (b) and (c) above. Like the cheap mechanical pencils I discussed above, I have plenty of “copies” of the Dixon and Tombo here, there and everywhere to make sure my old school pencil itch can be scratched any time. Let me be honest here. I feel like any self-respecting pen nerd should have a favorite multi pen or two. So, these two entries feel like obligations as much as anything. Don’t get me wrong – I use them often just not as much as the other gel or ballpoint options on this list. Frankly, multi pens are a weird category. On the one hand, they should be the answer to every pen nerd’s need to have more than one writing option on hand at all times. On the other hand, you cannot physically write with more than one pen at a time and multi pens never do their job as well as a single refill pen. Putting all of that aside, whenever I need/want the convenience of a multi pen I go for either my Pentel i+ or my Lamy 2000 with the final choice based on whether I’m in a gel ink or ballpoint mood. Ultimately, picking a multi pen comes down to minimizing concessions. So, if I’m going to use a gel ink multi pen then the refills need to work consistently (I’m looking at you Pilot Hi Tec C Coleto), thus my preference for Energel inks. 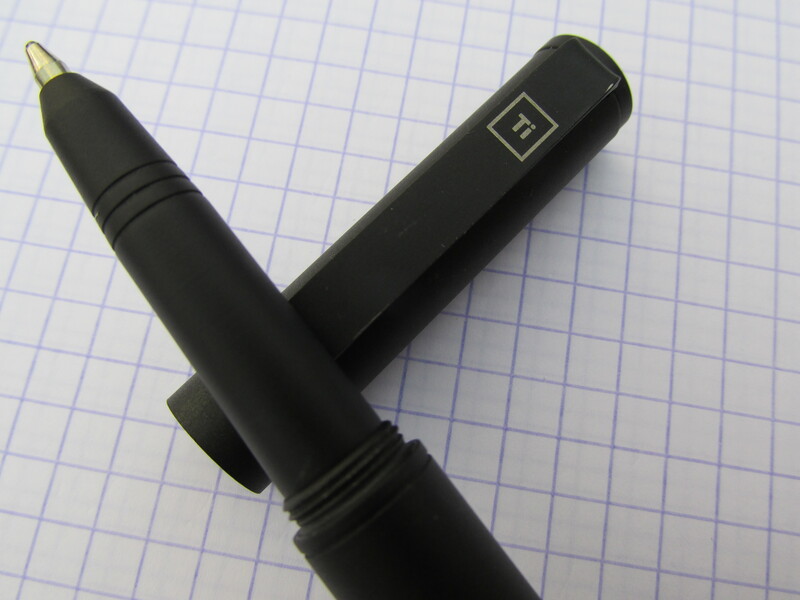 If I’m going to use a ballpoint multi then I prefer to go with one that looks and feels great, thus the Lamy 2000. These pens may not be true work horses for me, but they definitely pull their own weight on my pen and pencil farm. 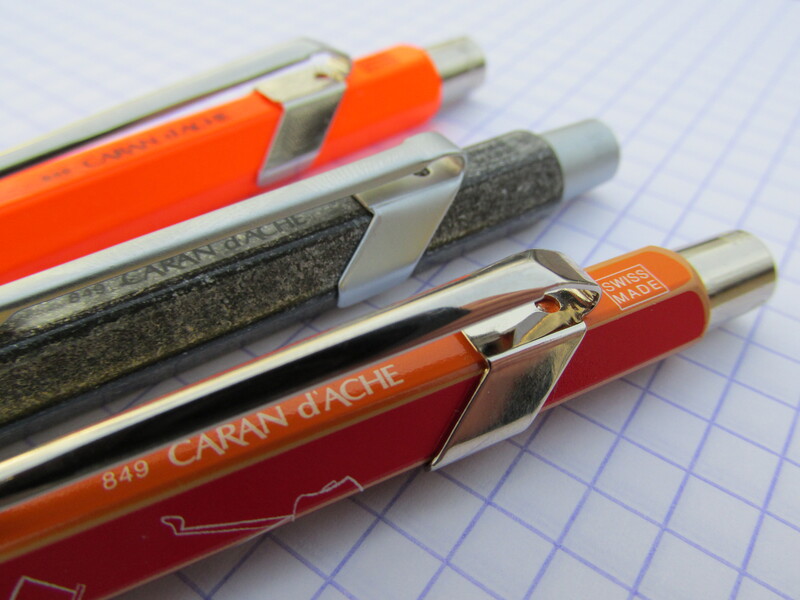 With all due respect to friends across the pond, the Caran d’Ache 849 is basically the european Parker Jotter. The 849 came along some 15 years after the Jotter. I don’t know its full history and looking stuff up on the internet can be so complicated, but I suspect the folks at Caran d’Ache were inspired by Parker’s work. Given the design of the 849, they were certainly inspired by the humble wood-case pencil so there is an interesting cross over there.. Like the Jotter, we have the flexibility of multiple refill options and the added fun of moderately priced collectability given the varieties of color and finishes available within the 849 line. Simple. Efficient. Well made. What’s not to like? In case you’re wondering, the pen in the foreground of the picture below is the 100th anniversary 849 Caran d’Ache released earlier this year. So colorful and detailed. The rOtring mechanical pencils I have may be the best made items in my entire pen and pencil collection. 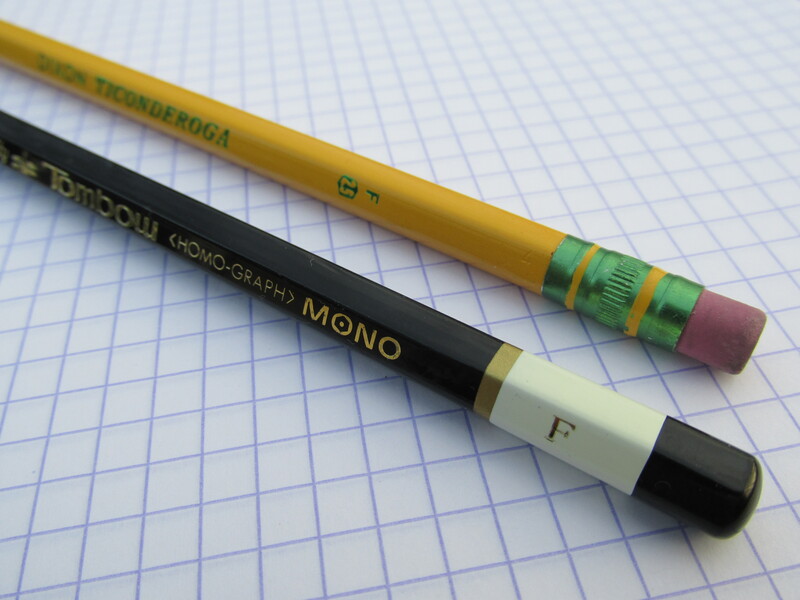 The precision, efficiency and build quality of these pencils is insane. As with all things, there is a point of diminishing return when it comes to price and mechanical pencils. After all, we’re basically talking bout a sleeve for a stick of graphite. 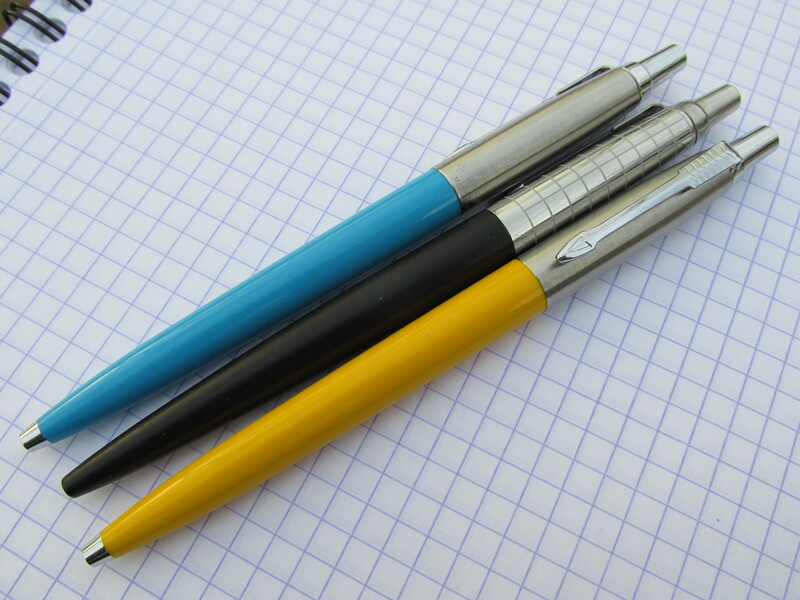 Still, if you have a need for mechanical pencils, why not use the best? Like any mechanical pencil, these rOtrings are not suited for extended writing sessions but when it comes to problem solving and other typical mechanical pencil uses, these tools are top of the line without being stupidly expensive (~$70). I dig the lava finish so much that I have two of the 600s (one for home and one for school) and the 800 is a constant travel companion. 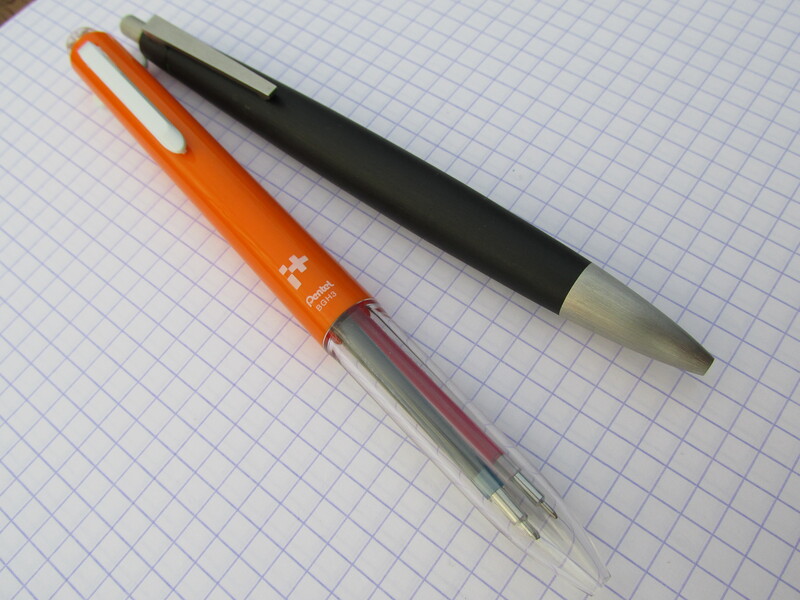 Both of these pencils have retractable tips (the 600 retracts with a click, the 800 with a twist) which adds to their pocketability. 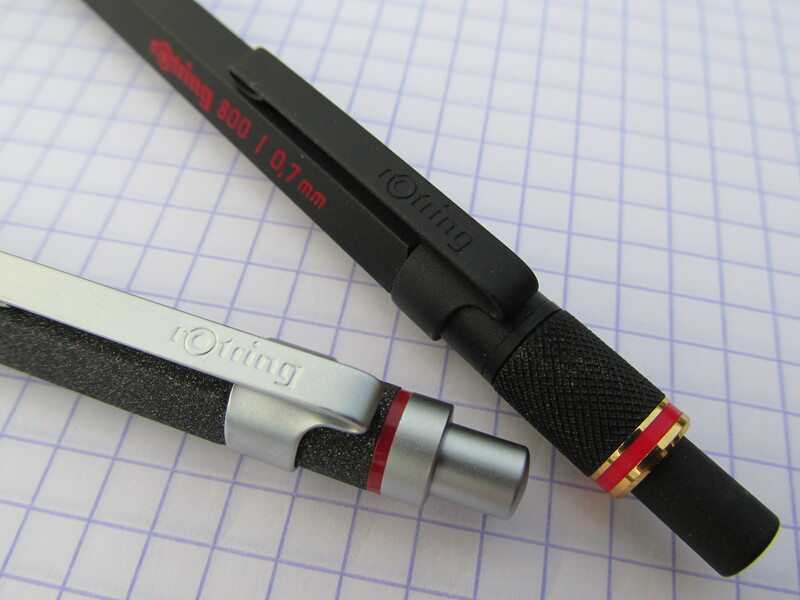 If you want to show someone how writing implements are supposed to be made and how efficient mechanical pencils really can be, show them a rOtring. Like I said, the gel pen world is a dizzying array of confounding choices. So, it makes sense that any pen nerd should have a couple of favorites from this category. Why the Pilot Juice? (1) It has a 0.5 mm canonical shaped point. I prefer cone shapes to needle points and when you get down to 0.5 mm and smaller, many makers go with needle points. (2) The ink chemistry of the Juice is different from the water-based Energel so it writes a tighter, drier line that compliments the Energel nicely. (3) It has the same size and shape of the ubiquitous G2 refill so it works in variety of pen bodies, including the Tactile Turn Mover discussed above. 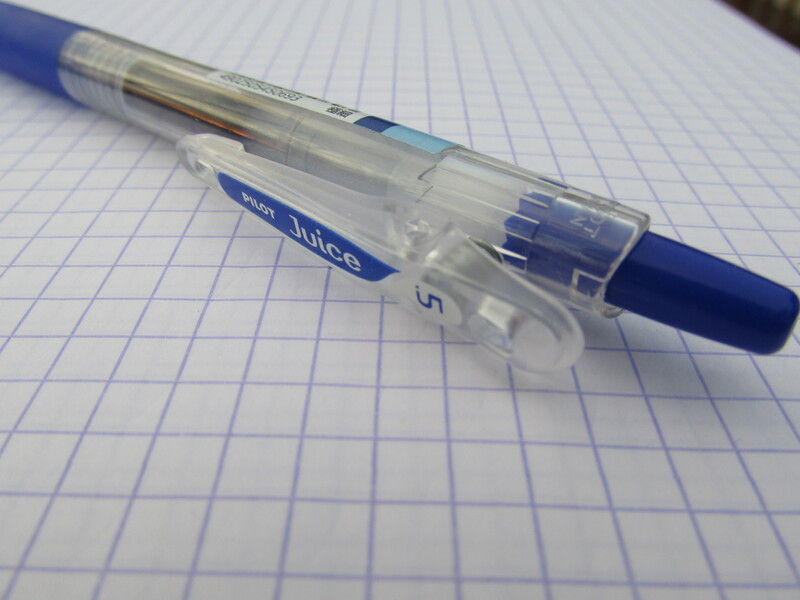 Given my preference for 0.7 mm lines in the Energel, you might think I’d like the Juice in 0.7 mm as well. That has yet to be the case. Maybe I haven’t tried the right color in the 0.7 Juice but, for whatever reason, the color intensity at 0.7 mm is less satisfying than at 0.5 mm to my eyes. Overall, the Pilot Juice is not my go-to gel ink but it is my go-to-next gel ink. This plucky little guy is the most recent addition to my consistently used list of pens and it’s here for one reason; the interior design of the pen is such that the Parker-style refill does not wiggle one fraction of a nanometer during use. With retractable ball points, there can be a hint of wiggle in the point. To be clear, this is not the case with my favorite Parker Jotters or Caran d’Ache 849s (but I am looking at you Retro 51). However, when I want a truly 100% rock solid feel in a ballpoint, I’ve been grabbing for the Ti ballpoint from BigiDesign in recent weeks. It’s not perfect. Un-posted it’s a bit too short and posted it’s a bit too long. But compared to bullet-style Fisher Space Pens which also provide a rock solid feel, the Ti Ballpoint’s grip area and heft of the titanium works better for me. It does come with a rather useless rubber stylus tip on the bottom end. Thankfully, you can swap it out for a flat end cap that comes with the pen. We’re closing in on 3000 words so this post is already too long. I will not go into significant detail for the items below, but I did want to mention a few paper items, inks and other things that fit into the broader pen/pencil world as way to round out this post. The Friendly Swede Micro Fiber Stylus – Along with all the money I spent on cheap mechanical pencils and Parker-style refills, I also spent too much searching for the best stylus for my iPad. This is one to get. It works first time every time. Pilot Iroshizuku Kon Peki – Like many of you, I have more fountain pen ink than I could possibly use in this or three more lifetimes. Of all the ink bottles I have, the level in the bottle of Kon Peki is the lowest – ’nuff said. Field Notes – You should carry a pocket notebook and you should carry the one that offers the best balance of paper quality, style and durability. Like many of my favorite products in this list, Field Notes has a certain inexpensive collectability that adds to the fun. Yellow Legal Pads – Honestly, I probably write more notes on these legal pads than on any other surface. I’m currently using the Docket Gold pads by Tops. They’re not perfect but they’re about as good as legal pads get. Nock Co. Dot Dash Index Cards – The last thing I do before leaving school each day is prepare a to-do list for the following day. I used to write this list on any old note card I could find. These days, I refuse to use anything but Nock Co Dot Dash cards. Park Sloper Wallet/Notebook Holder by One Star Leather Goods – I’ve been thinking about going with a smaller front pocket wallet and leaving the Field Notes naked in my back pocket, but this wallet is so damn well made and so damn functional that I can’t bring myself to make the switch. Mountain Briefcase by Topo Design – If I could recommend only one product in this entire post, the Mountain Briefcase might be it. I got the green one for Christmas last year and I could not be happier with it. It fits several pens, my MacBook Air, a legal pad, a stack of student test papers and various other bits and pieces with an insane level of efficiency. Pen Holders by Dudek Modern Goods – I have several of Mike Dudek’s solid walnut pen holders, including a couple that were custom-made. Also, I’m this close (forefinger and thumb about 1 cm apart) to ordering another custom piece from Mike. These holders may straddle the line between function and luxury so it’s not like you need one. Still, you should want one because they do what they do well and look great doing so. So there you have it. The pens, pencils and other stuff I actually use. Of course, this post will be revised in the weeks and months ahead but it won’t be updated without serious consideration. I hope you found this post 5% as informative as I have. Sitting down and clearly thinking about what you actually use, without worrying about what you think you should use or what is trendy, is an eye-opening process. Posted on 04/07/2015 by Todd	This entry was posted in Ballpoint, Field Notes, Fountain pen, Gel, Ink, Mechanical Pencil, Multipen, Paper, Pencil, Reviews. Bookmark the permalink. Todd, just wanted to say that I really enjoy reading your posts! I appreciate your opinion and agree with you on a lot of fronts! Thanks for stopping by Jessie. I’ve been a bit quite the past couple of weeks but hope to change that this weekend.